Charleston, S.C. – The Forest Resources Association and STIHL Incorporated honored Hasbargen Logging, Inc. from Birchdale, Minnesota as the National Outstanding Logger at FRA’s Annual Meeting in Charleston, South Carolina on May 3rd. FRA Chairman Bill Johnson presented Kit Hasbargen with a wooden plaque, while STIHL’s Kent Hall presented Hasbargen Logging with a $1,000 check. The Hasbargen family has announced that they plan to donate the $1,000 to Minnesota’s Gillette Children’s Hospital. On stage to receive the award were Kit Hasbargen, Clarence Hasbargen, Al Hasbargen, Clinton Cook, and Zach Hasbargen. 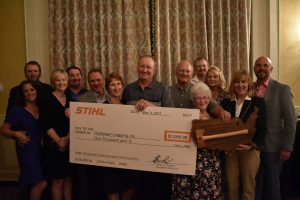 Upon receiving the award, Kit expressed his sincere appreciation to FRA and to STIHL. Kit related how sad he was that his father Alvin, who founded Hasbargen Logging, did not live long enough to receive the award that resulted from the work ethic and values Alvin instilled in all family members. In April 2016, Hasbargen Logging was named Minnesota’s Logger of the Year by the Minnesota Sustainable Forestry Initiative® Committee. Later that same month, the UMD Center for Economic Development named Hasbargen Logging a recipient of a Joel Labovitz Entrepreneurial Success Award. In September 2016, Kit Hasbargen was named FRA’s 2016 Lake States Region Outstanding Logger. All these awards cited Hasbargen Logging’s professionalism and community involvement as important factors. The 5th generation of Hasbargens have now started helping in the office, a sign that the family business launched by Alvin Hasbargen in 1943 will continue the long-standing tradition of excellence resulting from a strong work ethic and family values.